When your company is hiring, you don't want to settle for a candidate who will just get by in the job. You want someone who will excel, and who you can hopefully promote internally to begin building institutional memory. You need to hire hustlers and go-getters if you want employees to make a valuable contribution to your organization. But how can you find them? What did you do the last time something at work did not go as planned? An employee with potential to grow needs to be able to adapt. Someone who can think fast and roll with the punches is an ideal candidate for your organization. With those qualities, you can trust they will be able to hit the ground running. Have you ever been promoted, and why or why not? Unless a job seeker's career is just beginning, he should have at least one story of moving up into a higher position. If a candidate’s career trajectory has been flat with no upward moves, it is likely that candidate isn't a go-getter and won’t become one once you hire him. If you want someone with growth potential, this person isn't the right candidate for you. Have you ever been hired for a job you weren't fully qualified for? A person who has been able to talk his way into a job that he wasn't quite ready for is obviously someone who is ambitious and driven. The job candidate should also be able to explain how he got up-to-speed and was able to grow into the role. The results of these interview questions will help you hire a job candidate who has untapped potential. This will hopefully allow the person you hire to grow with your company and add valuable input. 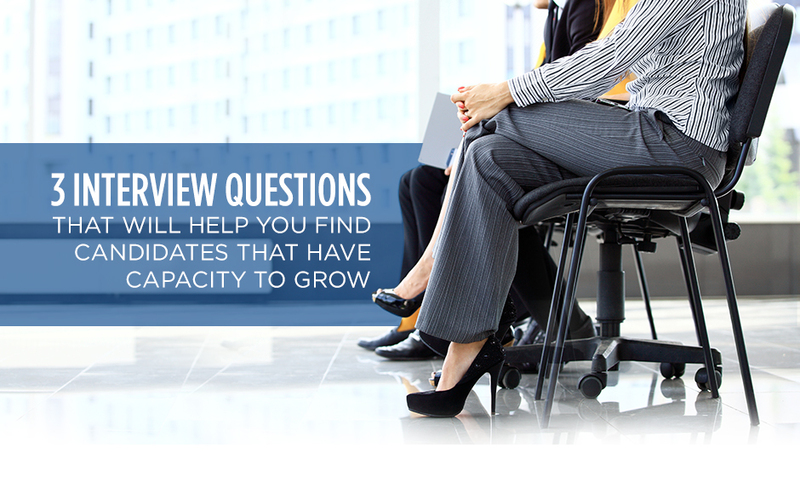 Of course, you need qualified candidates who will be able to answer these questions appropriately and who have the growth potential you are seeking. Eastridge Workforce Solutions can help you to find workers with lots of capacity to grow and with a solid base of skills to build on. Reach out to our staffing service today so we can connect you with the perfect candidates who will be a major asset to your organization now and in the future.